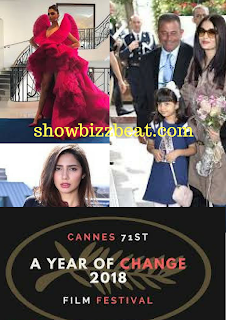 71st cannes film festival - Mahira Khan and Aishwarya Rai Bachan along with her Daughter Aaradhya Bachchan Reached the Event. The worlds biggest Exhibition is continue in France in its fourth day and till now the preparations of the stars are on the Sky. Like other Celebrities Pakistani Actress Mahira Khan is also there in France, and She had to Perform on 15th of May 2018, in this Exhibition . The Daughter in Law of big B- Amitabh Bachan also reached today along with her Daughter Aaradhya Bachchan. Remember this is 71st film festival of France. and like every years Exhibition, every celebrity is having the new fashioned dresses and makeups, Which will give them a different and attracting look. Walking on Red Carpet many Bollywood Celebrities have proven that they are really doing well in their field. The look of Deepika Padukone yesterday was amazing and new one, She was wearing the Red Mighty dress, which made her different from the other Celebrities . The government of Paris provided a high proof security to the Event .